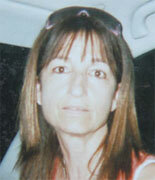 Aug 18, 2011 - Shulamit Karlinsky, 54, of Kfar Sava was one of eight victims of a series of terrorist attacks perpetrated against civilians and IDF soldiers in Israel''s southern region. Shulamit (Shula) Karlinsky was on her way to a vacation in Eilat along with her husband Dov and her sister and brother-in-law Flora and Moshe Gez. All four were killed when terrorists opened fire on their vehicle on Route 12 near the border with Egypt. Dov Karlinsky was driving. They were heading south when the border highway was blocked by gunmen who shot them each at point-blank range, an eyewitness said. Devastated family and friends related that the two sisters were also close friends who worked together in a daycare center for three- and four-year-old children in Kfar Sava. They held in high esteem by their colleagues, parents and young students. The sisters had just returned from a trip abroad, and their husbands surprised them with a vacation in Eilat. Shulamit Karlinsky was buried in Kfar Sava. She is survived by two children and two grandchildren.